Zing? NO. Our Lord does not seek to make fools but followers. “I Got You” are three words I heard in my heart on Sunday at Mass. 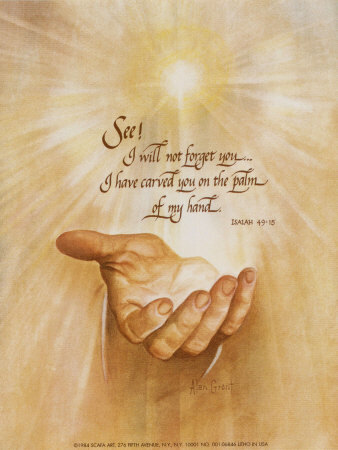 Not in any way to poke fun, but rather strengthening my soul as to how we are all in Christs hand no matter how many times a day we forget that truth. Last Thursday, I came home to find a 20 day notice posted on my door from our trust company that said we had 20 days to vacate the property as it was being sold at auction on July 7th. My husband and I had been in negotiations with our bank for over two years, trying to get a loan modification and it seemed this was the end of the line. I had been looking to rent a home for us for the past few months and even packed up a lot of belongings just in case. Every house we liked and hoped to rent, was given to another family and we just couldn’t find any place to rent. There was even one case where we DID find a place, but it turned out the person showing us the house and who wanted close to two thousand dollars security deposit, was not even the owner and had no right to rent the house in the first place! God was with us that day as the true owner came to that property, during the time we were going to sign the papers to rent it and hand over some money. We had 20 days left to pack up the entire house, find another to rent, be approved to rent it and move. Friday came and the only thought in my heart was to just leave everything we didn’t need. Take the clothing the children would need and some things that could not be replaced and just go where our Lord was leading us. I wrote about this once before here “Where Is Home“. Saturday came along with 5 registered letters from the trust company, stating the same 20 day notice. Sunday morning I woke up early to attend the first Mass of the day. I wanted to be completely immersed in the Mass and let the children to sleep so I could attended Mass alone without distraction. I was so confused about this situation. I had just been given the task of taking over recruiting souls for our Adoration Chapel. I had been asked to start a bible class for teen girls. I had been invited to become a class leader for Vacation Bible Study, asked to join The Legion of Mary and so many other activity’s at my parish, that losing our shelter was nothing to stand in the way of STILL being able to perform these duty’s. But! I couldn’t figure out why our Lord was opening up these doors, and I couldn’t even find shelter for my family. As I sat and prayed to our Lord for guidance, I looked up at His cross and heard the words “I Got You”. It strengthen my heart and soul. I knew I wouldn’t let any of my personal struggles get in the way. It didn’t bother me anymore. I just accepted it and knew He had me and since He had me, I have everything I could ever need. Monday came and so did another registered letter. This time from the bank. I opened it and here the bank was telling us, we had been approved for our loan modification. I was VERY puzzled! The trust company was just telling us something completely different! I went to Adoration to pray, when I got home, my husband had just hung up with the bank and confirmed the miracle. The house was ours and the trust company took the house off the auction block. The bank granted our loan modification ensuring we no longer had to move, nor negotiate with them any longer. Two plus years of house limbo and jumping through hoops, was over. I meant every word in the post “Where Is Home” and I will for eternity be grateful to our Lord for opening my eyes to what is important in all of this. My Country wasn’t going to save us. My family wasn’t going to save us. No one here could save us, but only our faith in God and love for Him above all things. Patience, Fortitude and Perseverance.